"Just before landing in the cornfields, I heard an explosion and saw smoke. Two people, including the balloon's pilot, reportedly survived the crash. Luxor lies on the banks of the River Nile and is home to some of Egypt's most famous pharaonic-era ruins. Hot air ballooning at dawn is a popular way for tourists to see Luxor's famous sites, such as Karnak temple and the royal tombs in the Valley of the Kings. "We flew over the ancient ruins. Just before landing in the cornfields, I heard an explosion and saw smoke. I think it was the balloon behind mine," he said. "I wasn't sure what had happened at first. It was only when we landed we heard the full extent of what happened." Ahmed Aboud, a representative of balloon firms in Luxor, told Reuters news agency: "There were 20 passengers aboard. An explosion happened and 19 passengers died. One tourist and the pilot survived." The British foreign office told the reporters it was making urgent inquiries with its colleagues in Egypt to confirm reports of British casualties. 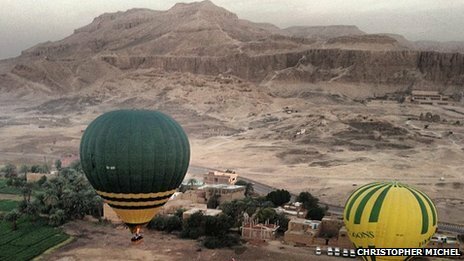 Hot air balloon crashes have happened in Luxor before. Two British women were among 16 injured when their balloon came down in April 2009.
lol... May their soul rest in peace.